After a successful run last year, the Plaza Brasserie Crab Buffet is back from now till 31 August 2013. That’s about 3 months for you to indulge in this All-You-Can-Eat Crab Buffet. When I go to a typical coffeeshop zhi char stall to have crabs, it would already cost at least $50 per person to devour some decent crabs. For Plaza Brasserie’s crab buffet which includes all their usual specialties from sushi, sashimi, deep fried calamari, dim sum, live cooking prata (durian or chocolate prata for that fact) and laksa, the price is $55++ for weekday dinners and $58++ for weekend dinners. I have been to some crab buffets, but Plaza Brasserie’s selection just gets bigger. 8 different crabs this time – not on rotational basis, you get them all. 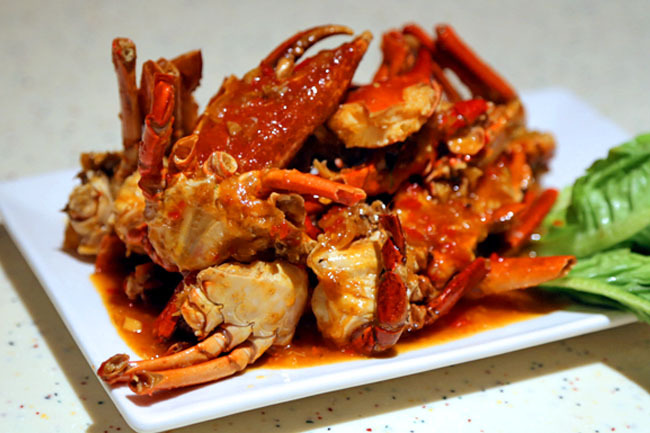 Other than the Singaporean favourite Chilli Crab and Black Pepper Crab, you can look forward to savouring new crab recipes – Crab with Tang Gui, Baked Crab, Nonya Curry Crab, Butter Crab, Stirred Fried Crab with Egg Yolk, Salted Egg Crab and XO Crabs. Some of the new line-up is created by their new Executive Sous Chef Ken Ang. My beloved crab for the day is easily the Stir-fried Crab with Salted Egg Yolk. While some customers may be picking out their favourite crab parts (pincers or claws) leisurely from the buffet table (faster can? ), I was just going for the remnants of the salted egg yolk because there were the tastiest parts, especially when you try to lick the spicy-sweet-salty yolk encapsulating the crab shells. Tip of the day: Use your hands. You have to get your hands dirty when eating crabs! 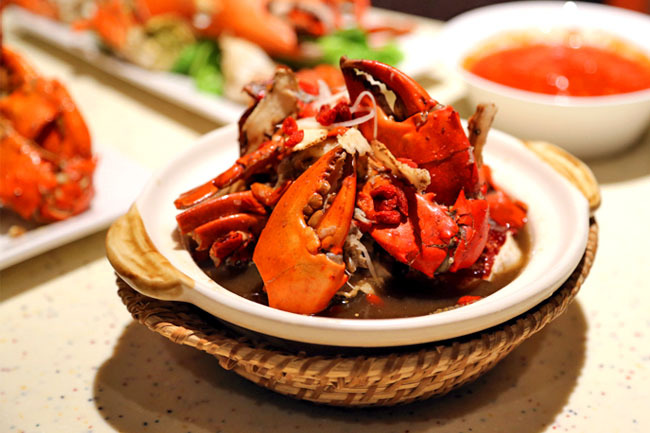 The ladies seem to flavour the Steamed Crab with Dang Gui and it is indeed less common to see herbal soupy style of crabs with wolfberries on the buffet table. Many of them go “It’s very ‘bu’” and go on downing the part-medicinal soup which they find very nutritious-tasting. Eating eight different crabs at one go, digging the meat and sucking all the ‘chup’… sounds pretty crab-citing all right. DanielFoodDiary.com will be giving away 3 buffet dinner vouchers to 3 blessed readers to enjoy Plaza Brasserie’s Crab Buffet! Results will be announced 18th June (Tues). BLACK PEPPER CRAB!! shared and retweeted! salted egg yolk crab! yums! YummY, YummY, YummY! Now that’s finger lickin’ good! Chilli Crab and Black Pepper Crab!!! WooHoo! Chilli Crab because I liked super hot crabs as they are a match. Holy crab!! Definitely Steamed Crab with Dang Gui!! Steamed Crab with Dang Gui is something I have never heard before… The names of the herbs appeal to me, I’ll try that one first! Holy crab! Steamed Crab with Dang Gui!! salted egg yolk crab for sure! Definitley the Stir-fried Crab with Salted Egg Yolk! Can’t wait to taste it! Chili Crab please! ceciliajoven@gmail.com (Shared on the facebook). Definitely the Stir-fried Crab with Salted Egg Yolk! Can’t wait to taste it! Nonya Curry Crab, that is full of flavor and packs a little punch. Steamed Crab with Dang Gui looks unique! Stir-fried Crab with Salted Egg Yolk!!!! Stir fried crab with salted egg yolk! I love salted egg! OMG… ALL look so nice…. I will attack the Stir-fried Crab with Salted Egg Yolk first…. Definitely the salted egg yolk crab! Just as I was about to find a place for my dad’s birthday dinner :D.. Hope can give my dad a surprise! Crabs are his fave. I would totally attack the dang gui crab first cause I’ve never tried it before! I really love crab especially salted egg and chilly crab. I want to win this please. steamed crab with dang gui! so interesting never tried before! I would totally attack the dang gui crab first cause I've never tried it before! Definitely the Steamed Crab with Dang Gui! That’ll be a first for me! so interesting! I want steamed crab with dang gui! never tried before……cherieyip@gmail.com. My best place to eat is at my grandfather’s place.He makes the best chilli crab as he used to be a navy chef. But now is impossible to eat. Really miss those days when my grandfather is around. I wanna attack Stir-fried Crab with Salted Egg Yolk! Yummy! Yummy! Stir-fried Crab with Salted Egg Yolk.. Yummy yummy yum!!!! I wanna attack Stir-fried Crab with Salted Egg Yolk. Yummy! Yummy! Will attack the stir-fried crab with Salted Egg Yolk! Yummy! My personal favourite place to eat is at my grandpa’s place. 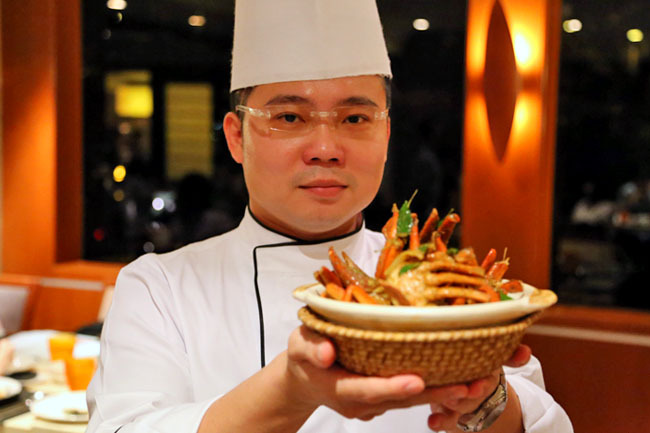 He makes the best chilli crab and seafood dishes in the house. He used to work for the foreigners in the ship as a chef. Its been so long since he left us and really miss his cooking. Wooo love all of them! If I have to choose.. it would be the Stir Fried Crab with Salted Eggs.. cant go wrong! Love love love it sooooooo much! Wooo love all of them! If I have to choose.. it would be the Stir Fried Crab with Salted Eggs.. cant go wrong! Love love love it sooooooo much! Really hope I win this treat! Chilli Crab because it’s my favourite! Chill Crab because it’s my favourite! I will attack Stir-fried Crab with Salted Egg Yolk first. My email add: jennyyennie@hotmail.com. Thank you! Chilli Crab because it's my favourite! Stir-fried Crab with Salted Egg Yolk. Stir-fried Crab with Salted Egg Yolk!! I am definitely going for the Salted Egg Crab! Simply Mouth Mouthwatering!!! Have shared in FACEBOOK and Twitter. Salted egg yolk, fo sho (awwcomeon [at] gmail). I can't keep my claw from u.
chili crabs because its so addictive!!! Stir fried crab with salted egg yolk! Have been searching high and low for a good salted egg crab. But have yet to find one that matches up to the very 1st time I ate it. Sadly, it closed down. My birthday is coming , bring us there! Salted Egg Crab will be the first on my list! Of course i will attack the rest of the crabs after that! Stir-fried Crab with Salted Egg!! I have yet to find one that tastes anything like the 1st time I ate it. Sadly, that place closed down. Salted egg yolk crab! Yum Yum!! I will attack the Steamed Crab with Dang Gui first!! I will go for Steamed Crab with Dang Gui first~! Stir-fried Crab with Salted Egg Yolk! Will attack the Steamed Crab with Dang Gui 1st given that its something really unconventional and hence, being the one reaping the most health benefits at the dinner table! chilli crab! are mantous provided? or I could just find out myself if you email em vouchers to caiyinzhou@gmail.com thanks! Sure to attack the Salted Egg Yolk Crab first! Yum! definitely the Stir-fried Crab with Salted Egg Yolk!!! I will attack the XO crab. it'll be like eating AND drinking at the same time! Definitely Stir-fried Crab with Salted Egg Yolk!!! I will try the Crab with Dang Gui! Sound very interesting! Shared post under my FB nick: Jasmine Jaschocolate. I will try the Crab with Dang Gui. Sound very interesting! Steamed crab with Dang Gui! My email add: jerrom55@hotmail.com. Thank you! Stir-fried Crab with Salted Egg Yolk…love the yolk! Stir-fried Crab with Salted Egg Yolk!!! Hubby and I love crabs loads!!! Crabs with dang gui sounds so interesting and nourishing! But I just couldn’t resist digging into the crabs with Salted Egg York first!!! Oh my goodness, just thinking about that yummylicious sauce makes me drool! Yumzzzz! Oh Holy Crab! Perfect timing for our next dinning date for hubby and me and hubby’s coming birthday celebration. I would attack the Stir-fried Crab with Salted Egg Yolk at the buffet table as this is something different from the Singaporean favorite chilli crab. I would want to have a different taste of crabs and experience the contrast between salty and sweet. I love liu sa pao so trying out stir fried crab salted egg yolk will be interesting to me especially I am someone who love trying out a variety of food not scared of gaining weight! email: quietstar87@hotmail.com ;). Oh holy crab! Perfect timing for our next couple date without the kids and hubby’s birthday celebration. Perfect timing for our next couple date without the kids and hubby’s birthday celebration. Attack XO crab first. Work from the mildest flavour to the strongest flavour to enjoy best. Let me feast on all the crab dishes! I want to attack the Nonya Curry Crab 1st! Let me enjoy @ eug87@hotmail.com. Will definitely attack the salted egg crab! It look delicious! what a load of craps..I like. I had dranken prawns before but yet to try XO Crab. Give me the chance to try for this delicious crabs.. email me at williamyong@yahoo.com. salted egg yolk crab. yummy !!! Please choose me as the winner and watch me attack the Stir-fried Crab with Salted Egg Yolk!! I WILL ATTACK the Stir-fried Crab with Salted Egg Yolk FIRST! Craving for Stirred Fried Crab with Egg Yolk at this Crab-licious Fiesta! All that you have posted were mouth-watering and yummilicious! I will definitely go for salted egg crab!!! My email address : chrissytang@gmail.com I want to win these vouchers so that I can celebrate my hubby's birthday on 20 jun!!! Stir-fried Crab with Salted Egg Yolk! I AM GONNA ATTACK YOU FIRST! Pick me pick me pls~~! Been years since I pass by all these crab buffet but can't try them till I start to work! Crab body as I feel that it is the sweetest part! Which flavour wise wise definitely the salted egg! Will go for the Steamed crabs with Dang Gui as this is dish cannot be found anywhere easily. I will be leaving Singapore for a year in August and will definitely be missing my crabs!! So I will tuck into the Singapore Chilli Crabs FIRST! YUM!!!!!!!!!!!!!!!!!!!! Salted Egg Crab for sure! Your pics look really gorgeous! XO Crab! 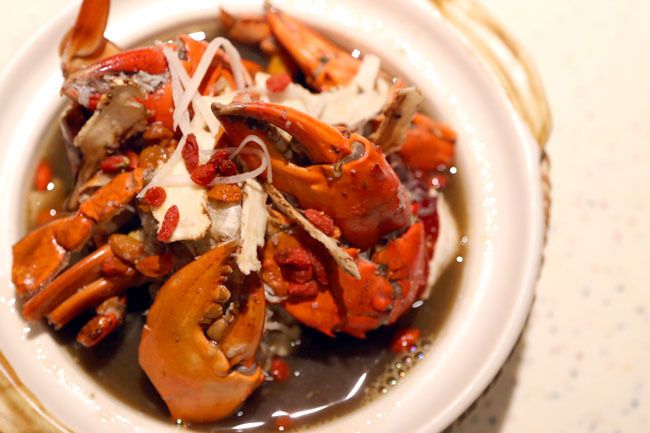 XO sauce will bring out the fresh taste of the crabs! salted egg crab! This is awesome! Yummy crab yummy yummy. If I have to attack only one crab in this never-ending battle against this Crab World, that leaves me no choice! Baked-Salted -Black Pepper-Chili-Nyonya Curry-Butter-Stirred Fried XO Crab with Egg Yolk and Tang Gui! I choose you! chingsingliang@gmail.com << PICK ME or all CRAB breaks loose! Charlotte Liow Crabbbb!!!!!!!!!!!! hahaha..now I'm hungry! Stir-fried Crab with Salted Egg Yolk! :Q :Q :Q.
I will definitely eat my beloved Stir Fry Crab with Salted Egg first!!! CHILLI CRAB!!!! I love CRABS! Best food on earth! Chili Crab! Cant wait to be back in Singapore! salted egg, chilli, black pepper! I will take them all! Stir-fried Crab with Salted Egg Yolk Email : dapgal1234@hotmail.com. Chilli crab! I love crabs! I meant salted egg yolk crab! Salted egg yolk crab definitely!! Heading to Singapore on erasmus from Ireland in July, would looove to try the cuisine for free when I get there! I would attack the stirred fried crab with egg yolk! No doubt about it! All in fact! I love crabs so much!!!! But if i need to choose, i guess it would be salted egg yolk crab! These days, im beginning to like salted egg yolk cooked this way with different seafood! Not forgetting chilli crab and butter crab too!! Definately the Stir-fried Crab with Salted Egg Yolk. Stir-fried crab with salted egg yolk (limjeremiah@hotmail.com). I love crabs, and I love dang gui… so the must-try dish for me will have to be Crab with Tang Gui. Yum! Oh yes.. I love to try the salted egg yoke crabs first! My email: nanahooi@singnet.com.sg. Without a doubt, it has to be Stir-fried Crab with Salted Egg Yolk!!!! Chilli Crab , Chilli CRAB , CHILLI CRAB!!!! I'll attack the salted egg yolk crab first! LIKED AND SHARED! yums! I will definitely attack the Stir-fried Crab with Salted Egg Yolk first as I love to lick the tasty spicy-sweet-salty yolk on the crab shells too! Chilli Crab is my first love! I love all the crab dishes but chilli crab is my first love. (Liked & Shared on facebook). Steamed Crab with Dang Gui wowww…..wanna try that! Definitely the Stir-fried Crab with Salted Egg Yolk! Finger-licking good! But if its come down to one … salted egg crab! salted egg crab ftw!!!! den attack everything else !!! liked and shared! i will def. try the crab with salted egg yolk first since it’s different from the normal typical chilli/black pepper crab! attack the salted egg! den attack everything else after that! I would love to try salted egg York crab!!!! Favourite of all times! Would love to try the salted york crab!!!! Favourite of all times! Retweeted your post! Would love to try the salted egg york crab!!!! Favourite since young! Retweeted the post! OMG definitely the salted egg crab! The rich sweet and salty sauce yumzzzz. Retweeted your post! Definitely the salted egg crab! That salty rich sauce with the sweet crab flesh yumzzzz. Retweeted your post! Do let me win I want to devour those crabs! Steamed crab with dang gui!! I agree with you that it is less common to see it being cooked this way. Would really love to try it! Thank you for sharing! All the best for SBA!! Steamed Crab with Dang Gui!! I truly agree with you that it is less common to see the crab being cooked this way, would really love to try it! Thank you for sharing and all the best for SBA!! Definitely the salted egg crab! That salty rich sauce with the sweet crab flesh yumzzzz. Retweeted your post! Do let me win I want to devour those crabs!!!! Definitely the salted egg crab! That salty rich sauce with the sweet crab flesh yumzzzz. Retweeted your post! Please let me win I want to devour those crabs! I will attack the XO Crab first! Definitely the salted egg yolk crab! I would like to try Nonya Curry Crab which is not common at Zhi char store or other restaurants. I will attack the chili crab lah! Crab.. I am so going in for the kill! pick me or you'll get crabs down there ^^. chilli crab FTW! going to try the other 7 types as well =). Bye bye waistline~ Grab all the salted egg yolk crabs!! Chiong for the salted egg crab first! Choose me choose me! Haha! 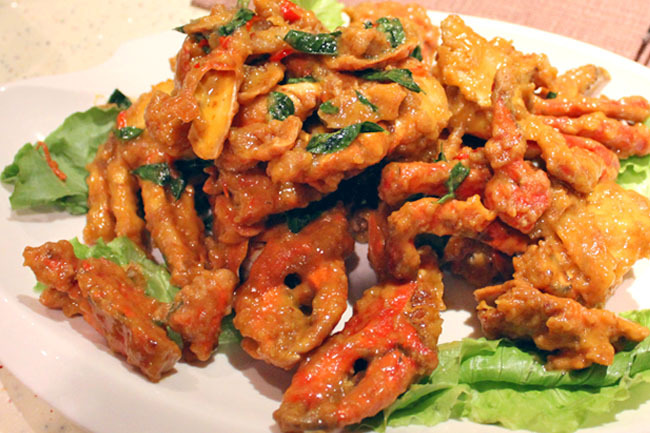 Stir-fried Crab with Salted Egg Yolk (px@garenasg.com). I will definitely attack Stir-fried Crab with Salted Egg Yolk. I would attack the Tang Gui first as to open up my eating appetite. Thanks for such crabby buffet – wonderful. Ooo… Definitely the Stir-fried Crab with Salted Egg Yolk. The unami of the salted egg and the sweetness of the crab sounds drool-worthy! Definitely the Stir-fried Crab with Salted Egg Yolk! Hope I win! Thanks for organising! I will try the Steamed Crab with Dang Gui first! As I think you cannot find this delicacy anywhere else.. I will attack Crab with Tang Gui first at the table! It is unique dish and I never tried this before. I see, I crack, I eat all the craps. I'll head for the salted egg crab first. pile on the cholesterol! and I'll make that buffet worth it ;). Stir-fried Crab with Salted Egg Yolk ! my all time fav will be butter crab! after dat, i will whack every single type they have! never tried baked crab, so that will be my 1st! then all the other types will follow suit, into my stomach! salted egg crab! love eggs! Chilli Crabs, Black Pepper Crabs!!! Slurps Slurps. Chilli Crabs, Black Pepper Crabs!!! Slurps Slurps..
Obviously the stir fried crab with salted egg yoke. It’s crazy awesome and totally worth it. Not every restaurant can do a good crab with salted egg yoke dish. And then, EAT EVERYTHING ELSE!!!!!!! Omg so many flavors (I can’t breathe)! I will attack the butter crab first! Then I will try every other flavor and not regret even when I put on a few kilos! Thanks for this post! I’m really hungry after reading this ._. Definitely the Nonya Curry crab. I mean where else can I get such an awesome dish?! And then, EAT EVERYTHING ELSE!!!!!!!!!!!!!!!!! steamed crab dang gui.. V special. I would definitely try the Singapore Chilli Crab first as that is my all-time favourite! Dang gui crab! Probably the first time i ever heard of such an awesome combination! can’t wait to lay my hands onto them! Heading for the black pepper crab first! Stir-fried Crab with Salted Egg Yolk. Definitely. Stir-fried Crab with Salted Egg Yolk of course! I luvs this dish till MAX! Even dreams of it! Lolz! Salted Egg Crab! Loves… slurps!!! I will attack the Stir-fried Crab with Salted Egg Yolk! 😀 EGG YOLKKK~~ :DDD. I always love crab. 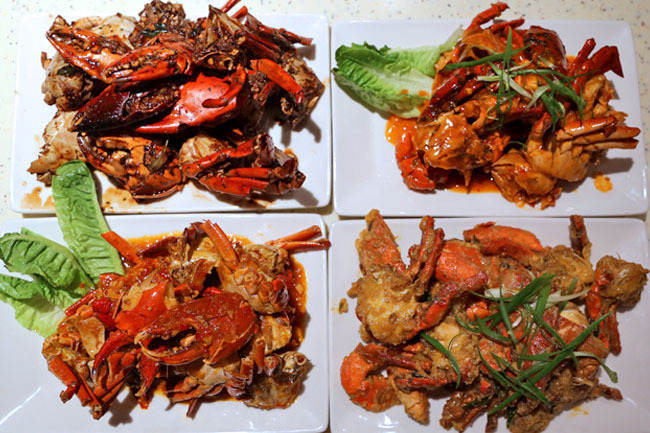 Chilli Crab, Black Pepper Crab, Salted Egg Crab, Butter Crab. I have tried them all. I have never try Steamed Crab with Dang Gui. It looks so "bu" and special. Hope I can have the chance to try this new dish! Thanks. Actually, I would attack the diners first, with an intention to kill. This way, we never have to worry about which crab to eat first. I will target the Stir-fried Crab with Salted Egg Yolk first, i couldn’t resist the finger licking salty goodness. Confirm plus chop whack the BLACK PEPPER CRAB first! ★ ~ ★ ~ ★ ~ ★ ~ ★ ~ ★ ~ ★ ~ ★. Stir-fried Crab with Salted Egg Yolk! Yummy! Stir-fried crab w Salted Egg Yolk!! Yummy!! I will attach salted egg crab..love it man ! i will attack salted egg crab, love it ! Whack the Stir-fried Crab with Salted Egg Yolk for sure! love crab coated with yummy salted egg yolk! shiok!!! I love Stir Fried Crab with Salted Eggs, so it will be the first I attack! stir fried with salted egg yolk will be my first victim muhahahahah. anyway my email is thatin@gmail.com thank you! Oh, my crab!!! I would attack the Crab with Dang Gui first to fully enjoy its taste before I start on the other stronger flavours!!! So long its' crab. I'm game! I never had a crab war before but I am ready to attack the Salted Egg Crab first at the buffet! Steamed Crab with Dang Gui. Awesome Steamed Crab with Dang Gui!!! Awesome Steamed Crab with Dang Gui! Liked on facebook! I am so going to go for chilli crab. basically, just follow the order and wolf them all down! BAKED CRABS! The original and freshest crabs ever~~~~~. It’s definitely salted egg crabs! It’s my favorite!! It’s got to be the salted egg crab!! My favorite! SALTED EGG YOLK! I WOULD DIVE AT IT! Stir-fried Crab with Salted Egg Yolk [Its sinfully unhealthy combo] But who's living life counting calories? Stir-fried Crab with Salted Egg Yolk!!!!!!!!!!!!!!!!!!!!!!!! As a Singaporean of course I will go for the black pepper crabs first haha! Going to drools everyday each meals thinking about the crabs haha ;D.
we will go Jumbo seafood for chilli crabs ! PICK ME! PICK ME because…. And we'll be happy ;). And we’ll be happy ;). Stir fried crab with salted egg yolk!!!! Definitely start with lighter Steamed Crab with Dang Gui, then proceed to Stir-fried Crab with Salted Egg Yolk because that's my all time fav, then probably Black Pepper Crab ;). And yes, there is always room for more crabs..
My email address is: valenciaseah@yahoo.com.sg. I’d attack the Stir Fried Crab with Salted Egg Yolk first in all it’s sinful, savory goodness because it melds perfectly with the sweet, succulent flesh of the crab to create the most wonderful sort of foodgasm in one’s mouth – a perfect gastronomic yin and yang match. All other crab dishes are lesser forms compared to the Salted Egg Yolk crab but I’ll take on all of them anyway at Plaza Brasserie. 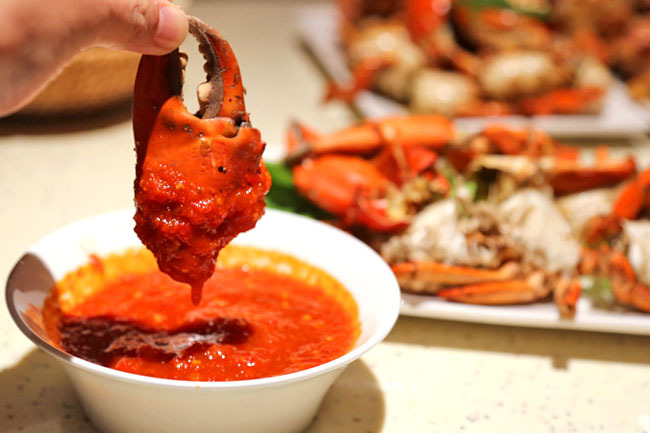 definitely Singaporean favourite: Chilli Crab! Hope to receive your voucher! I'd attack the Stir Fried Crab with Salted Egg Yolk first in all it's sinful, savory goodness because it melds perfectly with the sweet, succulent flesh of the crab to create the most wonderful sort of foodgasm in one's mouth – a perfect gastronomic yin and yang match. <3 <3 <3. All other crab dishes are lesser forms compared to the Salted Egg Yolk crab but I'll take on all of them anyway at Plaza Brasserie. Pick me please!! Will bring my dad for Father’s Day. He loves Crabs!!!! I'll attack Stir-fried Crab with Salted Egg Yolk first! Yummy finally a crab buffet! Give me all the crabs! But I want the salted egg yolk crab first! Yummy finally a crab buffet! I want all the crabs! But give me my salted egg yolk crab first! Yummy finally a crab buffet! I want to eat all the crabs but give me my salted egg yolk crab first! Chilli crab for me & family ;D.
1st will be the Stir-fried Crab with Salted Egg Yolk. But if it's somehow not available at the moment, will go for the Steamed Crab with Dang Gui as the 1st option. The crab meat should be sweet & light. A few slurps of the soup (which I assumed will be well done without any bitterness) would warm the tummy to prepare for further dishes. Thks for a good review. Chilli crab would be my first victim. Steamed Crab with Dang Gui of course! Didn’t tried it before and since it is so popular, must try then!! Chilli crab of course! It must be delicious just by looking at the pictures! The first crab I will attack is the STEAMED CRAB with DANG GUI because it sounds unique and I have never tried it before. I've been stuck in Australia (in the countryside) DEPRIVED of yummy asian food for MONTHS. I have been craving ALL sorts of Singaporean food for ages. I hope you could pick me and give me a treat when I go back home in Singapore! I love your blog because it reviews all the little restaurants that I've yet to try. The layout is very easy to navigate too! My goddaughter, who's studying in Australia, saw this and wrote to me that she "NEEDS to go here!" when she gets back. So, ELLTANN@YAHOO.COM would first grab a big helping of the Steamed Crab with Dang Gui to "bu" my girl who's been deprived of local food for the last 2 years. She turned 21 this month, so hopefully we will be blessed with the buffet voucher to celebrate her birthday and homecoming! Thank you! i’ll attack the salted egg crabs too! just cldnt resist the powdery like feeling of the salted egg items! Being a typical Singaporean, I will definitely attack the chili crab first! Stir-fried Crab with Salted Egg Yolk for the win! Must first strike hahaha. Salted Egg Crab no questions asked:P (cheefelicia@hotmail.com). Hope to win it and enjoy the crab buffet. Wish me lots of luck~ Hee! I hope to win Steamed crab with dang gui! I want to try all of the CRAB! STIR FRIED CRAB WITH SALTED EGG YOLK!!! I will attack the chilli crab first. Love anything spicy and if there is a dish called wasabi crab, I will certainly attack that one too! Salted egg yolk crab! Om nom nom..
Congrats to Natalie Teo, Tan Sern Ming Simeon, Valencia Seah for winning a dinner voucher to enjoy Plaza Brasserie’s Crab Buffet! Enjoy the crab feasting! Chilli Crab with Marcus Lim! I will go for the xo crab as I have never tried this before. Can’t wait to Attack….! Black Pepper crab is my all-time favorite! Any one is fine with me because I'm in charge of de-shelling all the times… that's my favorite task…. <3 Stir-fried Crab with Salted Egg Yolk to the max! Stir-fried Crab with Salted Egg Yolk!! Yummy yummy yum! Salt egg yolk crab is always awesome!!! Definitely the salted egg yolk crab cause i have taken a liking for salted egg stuff since a year ago! And the all-time favourite chilli crab tooo! Definitely the salted egg yolk crab! Love salted egg yolk food since a year back! Realised how salted egg yolk gives a special and unique flavour! Never liked it when i was younger, but now i love it! And of course the all-time favourite chilli crab! Of course it's crab and dang gui! Then its chilli and more chilli and then salted egg with XO! Hungry already leh.. please email the vouchers to me at joey.kwn@gmail.com. thank you thank you! Chilli crab, without fail.. Thanks! Steamed Crab with Dang Gui (ling_ot@hotmail.com). Stir-fried Crab with Salted Egg Yolk lydiaseah@yahoo.com.sg.